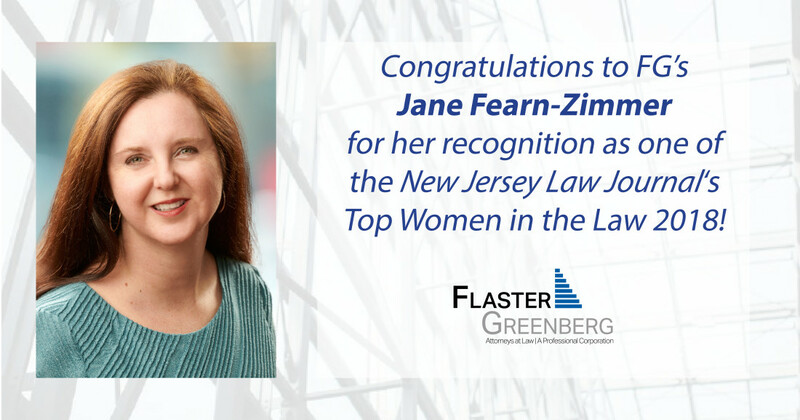 Flaster Greenberg PC shareholder Jane Fearn-Zimmer has been selected by The New Jersey Law Journal to receive the 2018 Top Women in the Law Award for her involvement in a Medicaid Caregiver Child Exemption case that helped change the Medicaid policy in New Jersey. Zimmer is one of only 20 attorneys selected to the prestigious list, which honors female lawyers who have influenced the law and legal profession in exceptional ways over the last two years. Earlier this year, Jane obtained a landmark Medicaid Final Agency Decision for her client’s family after a three-year long dispute with the New Jersey Division of Medical Assistance & Health Services and the Burlington County Board of Social Services, resulting in a reversed Medicaid penalty in the amount of $179,000 for her client based on the exemption for a transfer to a caregiver child. Without Jane’s persistence, tenacity and compassionate approach to this case, her elderly client’s continued care by the doctors, nurses and home health aides working in the nursing home who together succeeded in stabilizing her, would have been interrupted, putting her health and well-being at risk. Additionally, her son would have had to face a choice of losing the family home or possibly filing for bankruptcy. Jane’s case is a significant breakthrough in the law, because since approximately 2015, the State of New Jersey frequently denied caregiver child applications on the basis of a child’s ability to work while providing care for the parent. Information about each award recipient is highlighted in a special supplement that was published in The New Jersey Law Journal on November 5, 2018. Click here to read Jane’s feature. For a list of this year's recipients of the Top Women in Law 2018 Award, click here.